As the front cover says: “From the first take to final remix, discover the making of the greatest pop recordings of all time”. It is the first installment of what will be a four-book series. Volume 1 takes us in great detail through the albums Please Please Me, With The Beatles, A Hard Day’s Night, and Beatles For Sale. 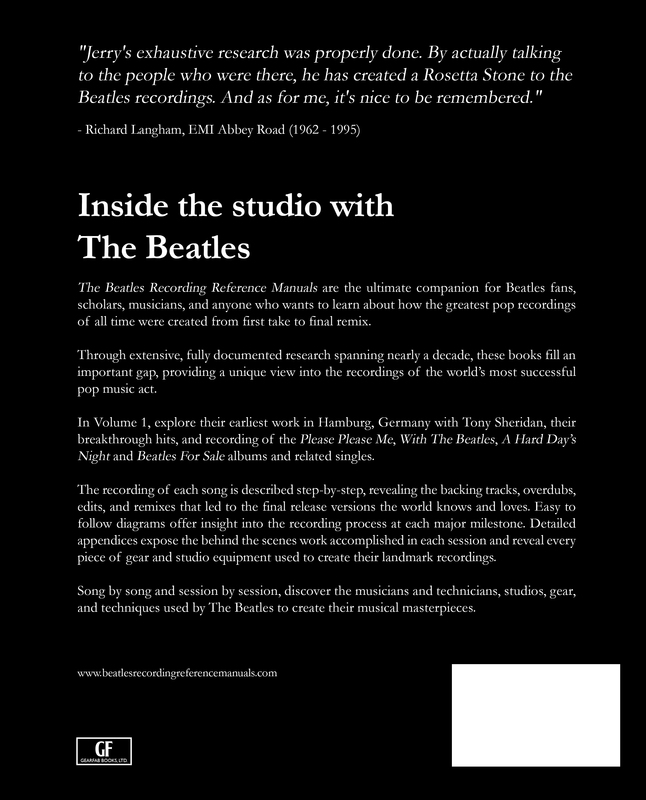 Over eight years in the making, Jerry Hammack has collected and analysed hundreds of recordings (takes, outtakes, remixes and the officially released versions), read hundreds of books and magazine articles, scoured photos, film and videos, and interviewed key personnel who worked on Beatle sessions to compile a definitive statement about just how each of their classic recordings was made. And put them to rest he does. 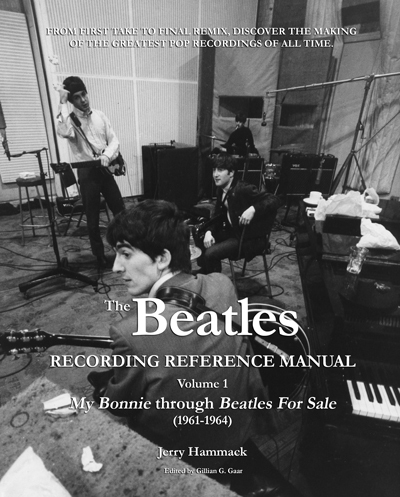 The Beatles Recording Reference Manual – Volume 1 – ‘My Bonnie’ through ‘Beatles For Sale’ (1961-1964) includes song-by-song descriptions of the entire recording process, complete with diagrams to visually describe what happened with each song. This allows the reader to follow the critical milestones of each work. Every entry has detailed session by session breakdowns of the people involved, instruments and studio tools used. Plus there are numerous appendices at the back of the book covering release versions, gear, and more. The book also has what I very much like to see in reference works of this nature: a Glossary of Terms, a thorough Bibliography, and a comprehensive Index, making things easy to find and cross reference. Volume 2 will take us from Help! to Revolver (1965-1966); Volume 3 will look just at 1967 (Sgt. Pepper’s Lonely Hearts Club Band and Magical Mystery Tour); and the final in the series Volume 4 takes in the LPs The Beatles (aka The White Album, through to Abbey Road (1968-1970). Really well worth getting hold of if you love to delve into how Beatle magic was made in the recording studio. The TG12345 MK IV, formerly housed in the famous Abbey Road Studio 2, is now up for sale as “Lot 35” in an upcoming Bonhams Auction event featuring a wealth of collectable rock music items. 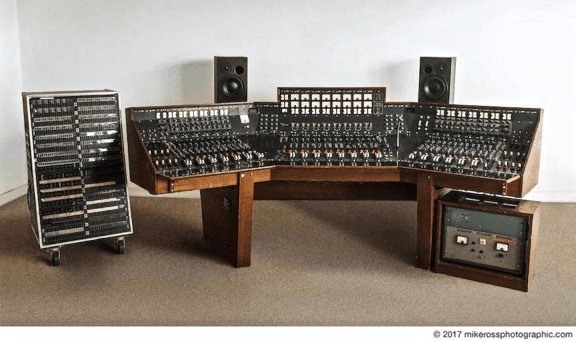 The console comes with letters concerning its provenance, including one from Ken Townsend, Abbey Road Studio manager at the time and future Chairman. Townsend worked with The Beatles as an engineer on numerous albums over the years. There’s a great little film about him here. The auction will take place in New York on March 27. Click here for more details. For any musicians out there looking to recreate the exact piano sounds found on many iconic Beatle recordings, it is now possible. A company called Cinesamples, working directly with Abbey Road Studios, has been given complete access to two of the vintage upright pianos in Studio 2. According to reviews, these two pianos – three if you count the harder-edged and more jangly Challen Tack version – sound flawless. These are really some pretty special instruments, with piano sounds that are just not available anywhere else. 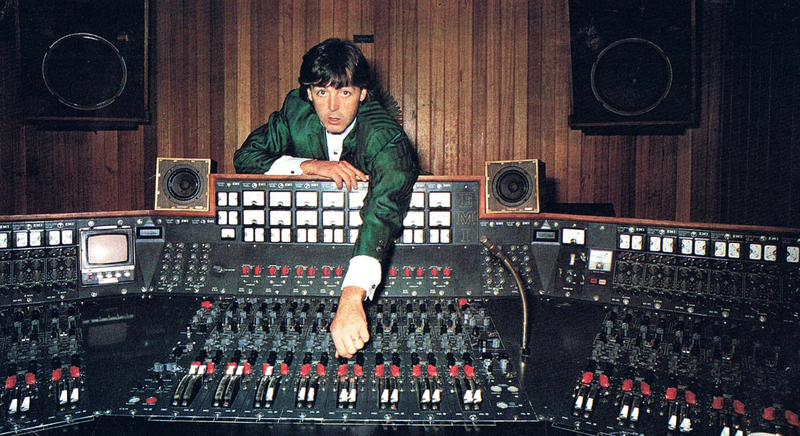 Given the impossibility of ever getting near one of these two pianos yourself, if you’re a musician this software provides a remarkable way to get the exact same sounds that the Beatles made onto your own recordings – or in live performances. 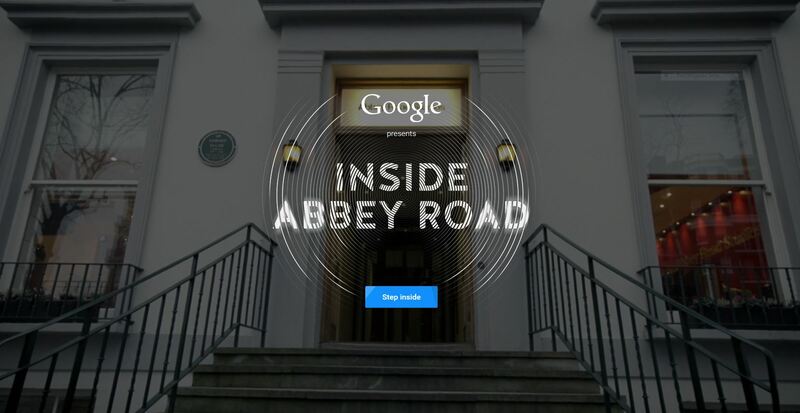 On the Google home page all you have to do is click on the link ‘Step inside Abbey Road Studios‘. When you do you’ll see this: Once inside you can choose to go to Studio One, Studio Two, or to Studio Three. 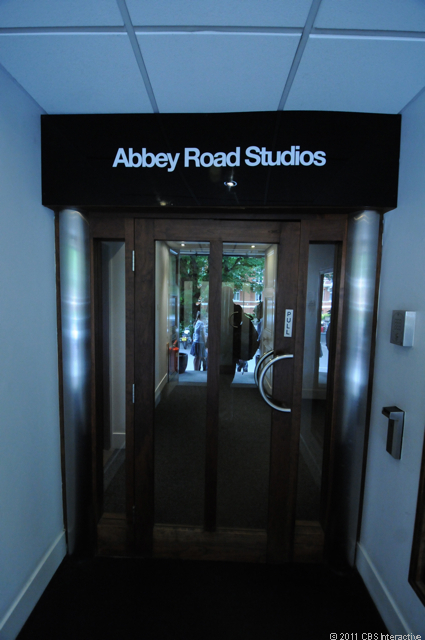 If you choose Studio Two (where the Beatles made so much of their music), have a look around. 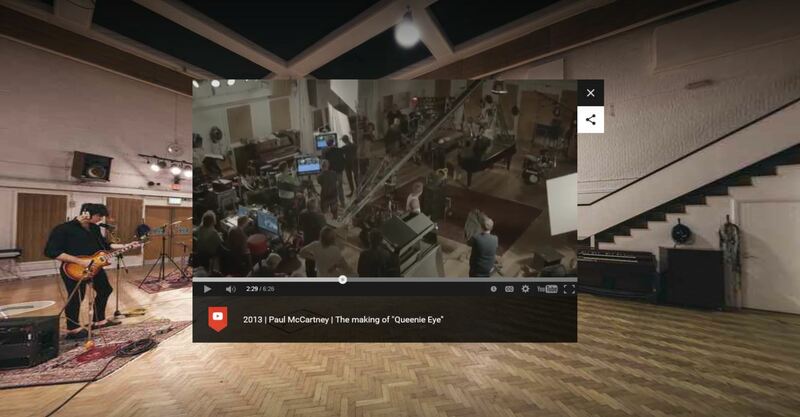 You can also click on a link to the making of Paul McCartney’s ‘Queenie Eye‘ video, which was shot entirely in Studio Two: Don’t forget to go upstairs to the Studio Two control room. There you’ll find Giles Martin at the mixing desk and a number of interesting features to click on: There’s also an option to visit the Abbey Road Mastering Room. Have a look at what’s on top of the stack of LPs on the coffee table at the back: This is a fantastic resource, one you can spend quite a while clicking around on and finding our more about the famous Abbey Road. Thanks Google! I stumbled today upon an article on (of all places) the computer/gadget specialist site CNet. 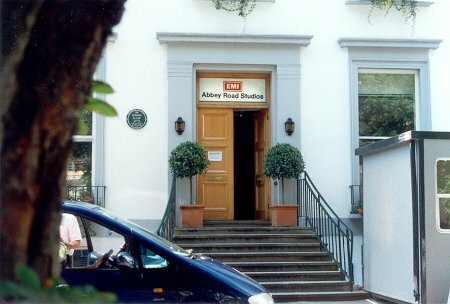 It is about the famed EMI Abbey Road studios in St. John’s Wood, London – the site of so much fantastic recorded music including just about all the songs recorded, in one way or another, by the Beatles. The studios have just turned 80 years old and it got me thinking about what an important role this particular pile of bricks and mortar on a nondescript street has played in the history of popular and classical music – not the least of which is the music of the the Beatles. 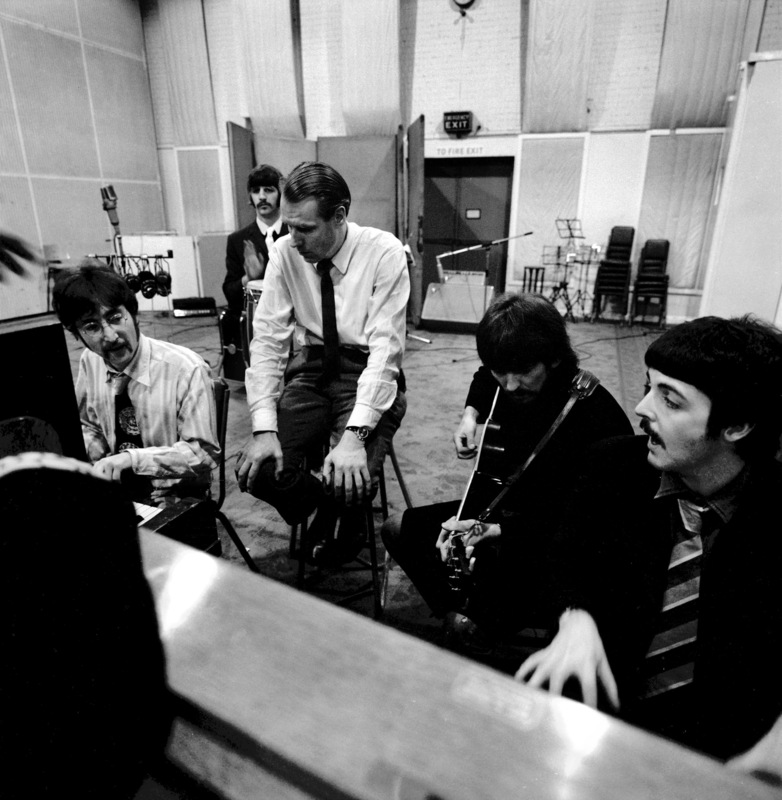 If George Martin is often referred to as “the fifth Beatle” then surely Abbey Road could be regarded as one of the instruments they played – with as much importance to the Beatles sound as the Gibson acoustics, the Gretsch and Epiphone electrics, the Ludwig drums, and the famous Hofner bass. 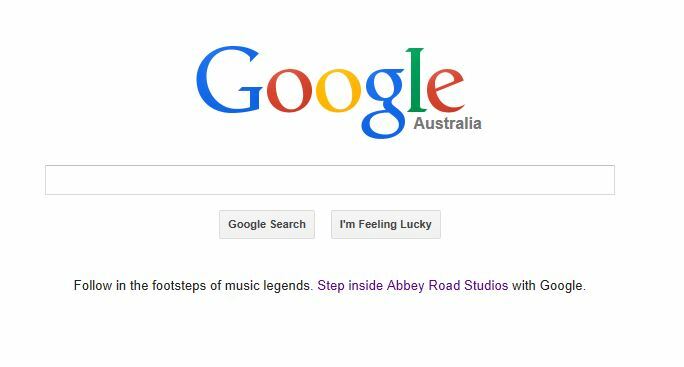 The CNet article has some very interesting observations made during a recent tour of the famous building and it’s numerous rooms – so many of which are associated with Beatles tracks. You have got to scroll through the thirty photographs taken during CNet’s visit. Its a terrific tour with some great shots for both Beatles fans and technical nerds alike. The studio itself has a website which is worth a visit every now and again to catch up on their news – one of the latest of which is the remastering of the Beatles “Anthology” series for digital download. So much happened at this one address – including the Beatles themselves honoring their home-away-from-home with an album bearing the studio’s name. Then there was the heritage listing for that famous zebra crossing out the front….and the zebra crossing web cam, now complete with live street sounds. 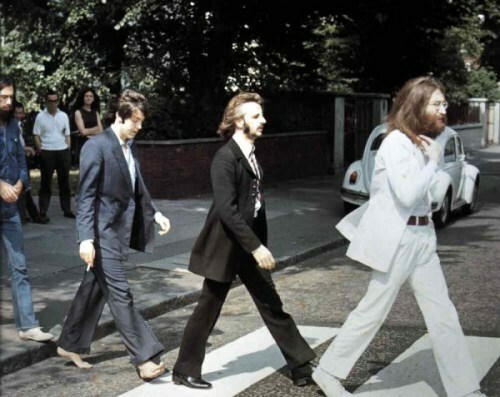 Its no longer in exactly the same spot as the photo on the front of the “Abbey Road” album having been moved down the road a bit from the studios – but countless fans still come each day, month, and year to be photographed striding across it. Happy 80th birthday Abbey Road Studios. Here’s to 80 more years.